Your iPad can serve as a tool to help you get your business done. You can manage documents, do presentations, and create diagrams on your tablet. The App Store has plenty of business-friendly apps available for download. Grafio happens to be one of those. It is an elegant application that enables you to create business models, flow charts, infographics, mind maps, and mockups on your tablet. Grafio is quite versatile. 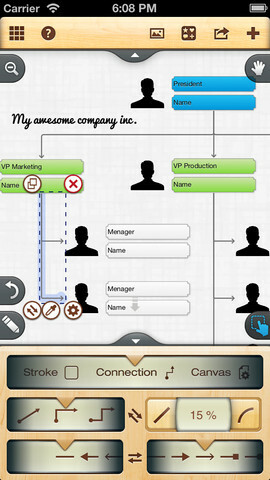 It can handle all kinds of models, charts, diagrams, and mockups. It has figures, curves, and lines. The app offers shape recognition for your hand drawn shapes. You get 50+ fonts for you to choose from and 10 different connection types. Just like all modern mind-map apps, you get to undo/redo steps and export your data in various formats, including PDF, JPG, and PNG. AirPrinting is supported too. Grafio is a universal application. It works fine on iPhone and iPad. The app is Dropbox and Box.net friendly. It offers VGA output for presentations. 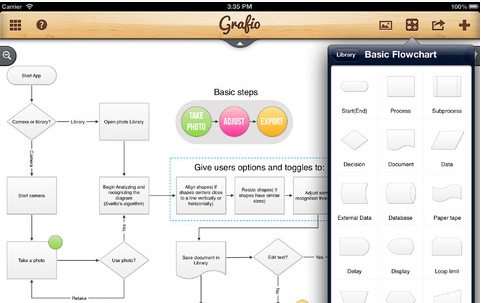 Whether you want to create product mockups or map out your ideas on your iOS device, Grafio has you more than covered.